Spring has begun, and so has Japan's obsession with cherry blossoms. The pale pink blossoms or "sakura" are in full bloom, signaling that it's time to flock to parks across the country for picnics under the cherry trees. At Tokyo's Yoyogi Park, people waited for hours to reserve the best spots to view the picturesquetrees. "I really enjoy sitting down here with my friends eating and joking around," said 17-year-old student Megumi Kohara. 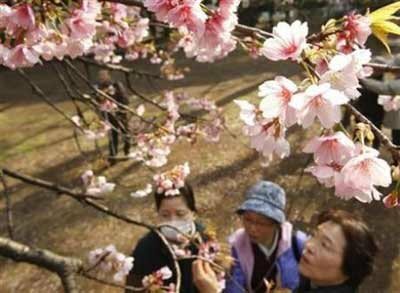 These flower-viewing parties called "hanami," or "flower viewing" in Japanese, are spring traditions held among families, friends, or co-workers. Parties beneath the cherry trees can go on all day and night, especially during the weekends. The cherry blossoms are also associated with new beginnings as the country's business and school years start on April 1. As the blossoms -- a national obsession found in paintings, poetry and literature dating back centuries -- appear only briefly, throngsrush to catch a glimpse of them before spring rains sweep their fragile petals to the ground. Some Japanese say that the cherry blossoms' ephemeralnature serves as a poignant reminder of how life itself is fleeting. Unlike in many countries, it is not illegal in Japan to drink in public spaces and the hanami get-togethers involve plentiful beer and sake. "Cherry blossoms bloom for such a short period of time and then they fall off in a dramatic way and I like to enjoy them while drinking," Tsuneo Ikuhara, 65, said.